Winter is a good time for many to reflect back on last year’s yields and nutritional programs to identify areas of change that may need correcting going forward. Where applications of phosphate and potash were made based on estimated yields and assumptions on straw management, actual offtakes could be very different, which unless corrected could lead to shortages going forward. If the field is due to be resampled, this is unlikely to cause a problem, as the resampling will clearly push the ‘reset’ button to work from going forward. If, however, resampling is not due for a couple of years, then corrections should be made when possible to ensure inaccuracies are not carried forward from one year to the next. A change in yield, either side of the estimated value, will clearly have a bearing on the actual offtakes of phosphate and potash compared to the estimated values; however small changes are unlikely to be significant in any one season. The biggest errors are likely to occur from a change in straw management at harvest, compared with what was planned. As a large amount of potash is stored in the straw, an application that is made to a cereal crop assuming the straw will be returned to the field could in reality be approximately half of what is removed if the straw is actually baled and taken off the field. This is before any alterations for yield. Recommendations made for a winter wheat crop, assuming straw is returned, with an estimated grain yield of 9.5t/ha would be 53kg K2O/ha (assuming the soil is at index 2- and therefore applications are being made to match offtake). If at harvest, the field ends up achieving a yield of 10.4t/ha and the straw is removed, rather than incorporated, the offtake from the field is actually 108kg/ha. The PDA calculator is a useful tool for not only calculating P&K offtakes for a large variety of crops, but it also allows the user to calculate the application of phosphate and potash to raise an index over a specified time frame, depending on the soil type of the field in question. The build up values in RB209 do not factor soil type into account and assume a time frame of 10-15 years, which is a long time to live with deficient soils (although Section 1 also gives recommendations to build indices over 5-10 years). 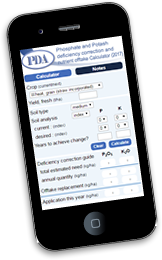 Find out more about the PDA Potash and Nutrient Calculator.